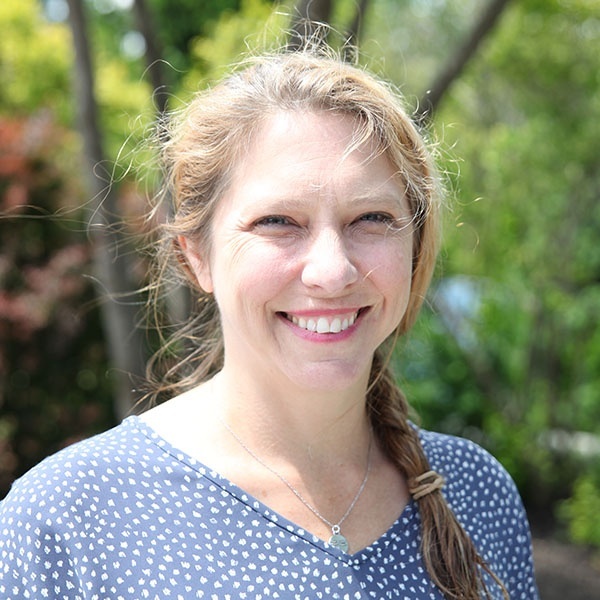 Tracy Roman, associate finance director for UC Davis Stores, organized a De-stress Week on the quad during finals last spring that was so popular the store has committed to repeating the effort at the end of every term. 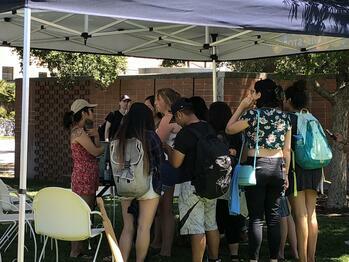 Planned activities like rock-painting and giant Jenga attracted students to the five-day event, but the most popular day involved animals. The store brought in adoptable kittens and therapy dogs for students to play with, pet and snuggle between exams. Students who wouldn’t normally have paused in their routine took time out for the animals. Shouldn’t they just get over it? Those who don’t suffer from anxiety sometimes think it’s a petty concern that should be overcome with a little grit and a positive attitude. It’s true that term papers, final exams and late-night study sessions are good challenges, which help students develop a sense of autonomy, responsibility and accomplishment. However, anxiety is different from the positive stress that increases adrenaline and motivates us to crack the books or meet looming deadlines. Anxiety brings dizziness, heart palpitations, nausea, disorientation, sleeplessness and scattered attention. When anxiety strikes, stress becomes paralyzing. Untreated, it can damage a host of bodily functions including cognition, memory, digestion, circulation and immune response. Anxiety can damage learning and memory, and it can poison a person’s quality of life. Excess stress not only undermines productivity — it interferes with activities that many would otherwise turn to for relief. Watching TV, exercise, playing computer games, visiting with friends: these typically relaxing activities can become unbearable during a bout of clinical anxiety. In one study published in BMC Psychiatry, an anxiety sufferer described the mind-state and the positive impact feline friends can have. “You just want to sink into a pit and retreat from the entire world,” she said. The cats force me to still be involved with the world,” she said. Another patient theorized that pets offer something humans often can’t: Unconditioned, non-judgmental acceptance — no questions asked, no strings attached. “[Pets] don’t look at the scars on your arms. They don’t question things and they don’t question where you’ve been,” he said. Pets don’t need explanations about why you're upset, why you didn’t complete a homework assignment or whether you have studied enough. They don’t tell you to get over it. They simply offer the kind of relief a generation of kids increasingly needs. Anxiety levels have spiked among young people — especially those born after 1995, known as Generation Z. Between 2009 and 2015, the number of students seeking help from counselors on campuses grew 30%, even though enrollment only increased 6%, according to the Center for Collegiate Mental Health. Among those going to counselors, 61% reported “overwhelming anxiety,” according to the American College Health Association. "We've seen our fair share of stressed students," said Torian Keller of William & Mary Bookstore. "They come into our store, sit in our café, put their headphones on and just … work." Some researchers blame the crisis on the rise of smartphones. Others argue that kids’ addiction to social media hampers interpersonal development. On Instagram, an awkward sentence or image can become a target for attack, not just from peers but from millions of strangers who share the post. Every time a teenager posts a meme or reflection, he or she risks crushing social opprobrium. With so much at stake, simple efforts to connect become meticulously crafted, self-conscious performances. When kids find themselves face to face with other human beings, they feel lost without technological support. You can’t auto-correct or photoshop a class discussion. You’ve got to be raw and imperfect. That can terrify those accustomed to polishing their images and thoughts before they’re shared. The BMC Psychiatry research showed how pets can help. The study authors posited that pets provide anxiety sufferers with a sense of connectedness and “ontological security.” That is, they keep anxiety-sufferers grounded in the real, non-mental, non-virtual world. They take people’s attention away from catastrophic stories whirling in their minds and restore a sense of rootedness, perspective and self-efficacy. Pets accept human foibles without complaint. In one study, 74% of owners reported that pets boosted their mental health, 75% said their pets improved a friend or family member’s mental health and over half (54%) said pets helped their physical health. Meanwhile, nearly all owners (98%) said they consider their pets significant members of their family. 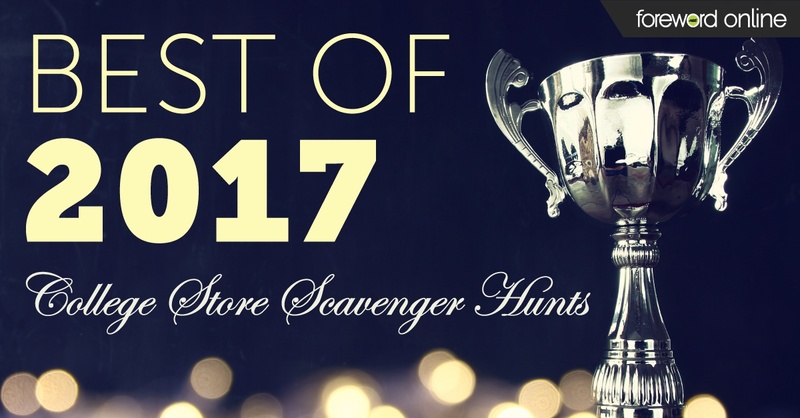 The anxiety increase among students has prompted college retailers to think about ways to help students associate their store with a community that provides respite from fears the academic grind can induce. Roman read an article about student stress in The College Store Magazine that inspired her to organize the UC Davis Stores event. “I thought, We’ve got to do something to help these kids,” she said. Roman realized the anxiety crisis among young people was out of control. She persuaded the UC Davis College Stores marketing department to organize a de-stress week devoid of the usual techniques retailers use to draw students, move merchandise and boost revenues. She was determined to keep the event free from any sort of promotion or gimmick. 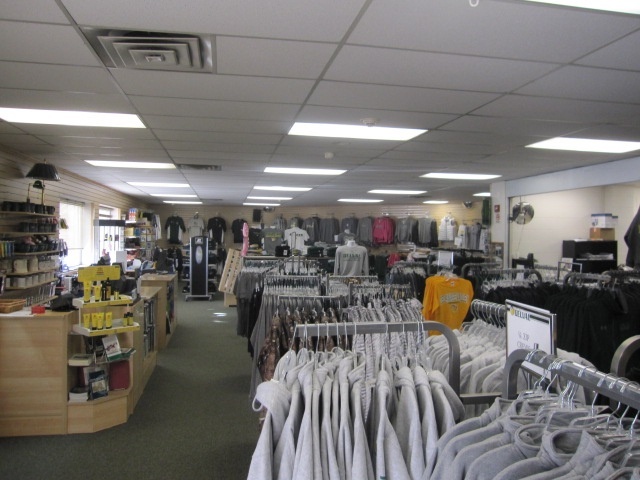 It was critical to convey the message that the store genuinely cares about student well-being. Davenport University’s Student Life Team in Grand Rapids, Michigan has a similar offering. It hosts therapy dogs for a “stress-busters” week in the school’s Center for Campus Life at the end of each semester. Therapy dogs are trained specifically to help humans with psychological and physiological stress. They are highly sensitive to fluctuations in human emotion, nuzzling or even crying when a human friend exhibits signs of emotional distress. Just a brief encounter with such uncomplicated empathy can bring relief, stimulating the antidepressant hormone serotonin and oxytocin, what’s often called the “love hormone.” Oxytocin grounds us with a sense of connectedness and purpose. 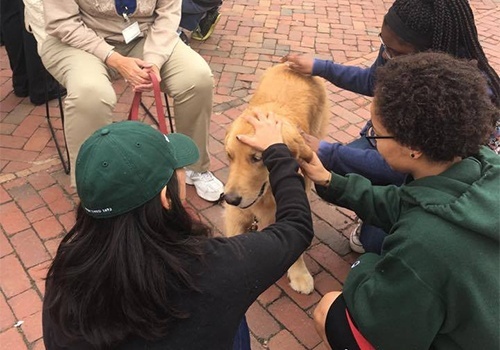 William & Mary Bookstore on Duke of Gloucester Street in Williamsburg, Virginia hosts a “De-stress Fest” at exam time every semester that features dogs from a local shelter. Assistant general manager Torian Keller said the store prioritizes student stress-relief in part because competition at the college is so intense. 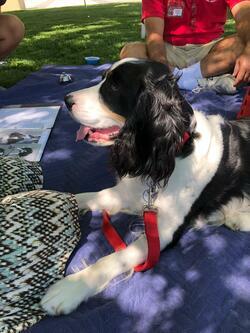 Steve Levin of Swarthmore Campus & Community Store in Swarthmore, Pennsylvania discovered the therapeutic effect dogs have on students by happenstance. He had moved into a new house, and, during the weeks of remodeling, he brought in his two black labs, Bear and Allie. “I thought maybe I could sneak them into the bookstore for a week,” said Levin. One week turned into several and soon students became so attached to the dogs, Levin started bringing them with him to work daily. He said Swarthmore students bonded with the dogs and sought them out in moments of emotional need. “It’s a little touch of home. Many missed their pets, but, even for those who haven’t ever had a pet, it’s a calming influence. Studies show that more companies are allowing employees to bring dogs to work, too. A lot of people are so jealous of me!” Levin said. After Bear and Allie passed away, Levin got Molly and George, also black labs, and started bringing them into the store. At the time, he was the textbook manager, so the two canines showed up to work every day. 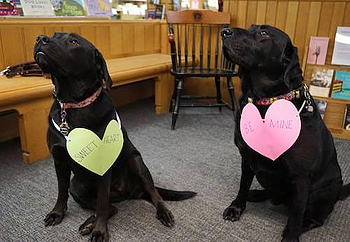 When the Swarthmore Campus & Community Store moved to a new location, the administration decided to honor students’ affection for Molly and George. Designers featured a silhouette of two black labs holding maroon shopping bags in their jaws in the store’s logo, and architects built a special cubby for Molly and George, outfitted with a doggie gate so the labs could watch customers come and go. “They can see the public and the public can see them,” said Levin. The new store location on the edge of town attracts families from the surrounding areas as well. Should your school give four-legged friends a try? Associates at Swarthmore, Davenport, William & Mary and UC Davis strongly recommend bringing in animals to help students take a break and find a sense of home. 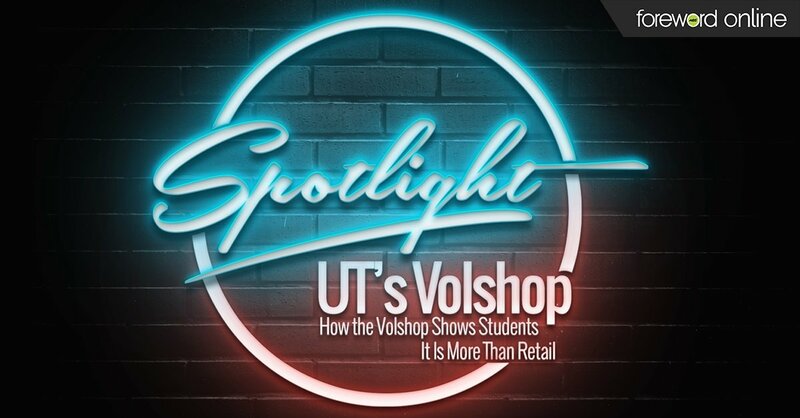 Course materials can be costly, and collegiate retailers are often looking for ways to counter the misperception that their store exploits students. The animals help students bond with associates and realize the entire school aims to foster their success. "Students come in and sit on the floor or lie down and hang out with the dogs," said Swarthmore's Levin. Levin said it’s important for stores to have good-tempered animals involved. He said Molly and George have particularly mellow personalities, even for retrievers, which are known as a family-friendly breed. A little chill time with some laid-back friends is exactly the sort of medicine hyper-stressed young people need — and it can go a long way toward helping students foster a warm relationship college stores.